"Just say mister I'm sorry I got no time to die I'm too busy and then turn and run like hell. If they say coward why don't pay any attention because it's your job to live not to die. If they talk about dying for principles that are bigger than life you say mister you're a liar. Nothing is bigger than life. There's nothing noble in death. What's noble about lying in the ground and rotting? What's noble about never seeing the sunshine again? What's noble about having your legs and arms blown off? What's noble about being an idiot? What's noble about being blind and deaf and dumb? What's noble about being dead? Because when you're dead mister it's all over. It's the end. You're less than a dog less than a rat less than a bee or an ant less than a white maggot crawling around on a dungheap. You're dead mister and you died for nothing. - Henry Kissinger, quoted in "Kiss the Boys Goodbye: How the United States Betrayed Its Own POW's in Vietnam"
The Enemy Within is a sobering revelation on the reality of what the combat veteran has to face when seeking answers to the reasoning that sent him or her into harms way to begin with. Those conspiratorial bastards who have immunity for their egregious actions and manipulation of the Constitution have and are hiding behind the Umbrella of the Feres Doctrine. That basic information will be displayed here as well. America's military members, on active duty, in the reserve forces and retired have a homegrown enemy almost as dangerous as the terrorists they fight around the world. This enemy has been responsible for more pain and loss of life than the bullets and bombs of combat zones. Under the disguise of friendship and support, this has kept our military community distracted and has stopped any organized response to the pain and suffering it creates. Added to this, the enemy of our military forces works from a position of power and control, making it next to impossible for those who serve or have served in uniform to win many face-to-face battles. This hidden enemy is the political establishment of Washington. It matters not what political party is examined, both Democrats and Republicans can be placed on the enemy list, either by their actions or inactions. And it is always the same snake dance. When out of power, the political party attempts to woo active duty service personnel, veterans and retired military with promises of support. Candidates wave the flag, make speeches, and fill the newspapers and television screens with pledges of "promises kept". At the same time, the party in power paints itself as a strong supporter of military issues, while behind the scenes finds every way possible to make sure no promise becomes law. A look at the current political landscape will prove this point. We have former military officers looking to advance the Democrats by parading the support of their "band of brothers" from Vietnam. The media is lauding their military heroism, medals earned, wounds received and missions accomplished. All of this for a party trying to regain the seat of power, while ignoring the hard facts of reduced military support while their party was last in the nation's chair of leadership. The other side of the coin has insider operatives and Washington bureaucrats angry and chastising the few Republican elected officials who have made the political "error" of supporting veteran and military issues. While it is true they are providing weaponry and equipment to fight a war, it is coming at the expense of previously pledged "promise keeping". This is the same party that did everything possible to gain the military and veteran vote while running for national office during the past two election cycles. While the political double-dealing is taking place, important issues for the military community go unresolved. 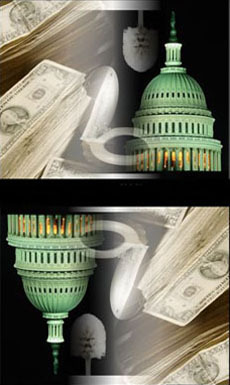 Issues such as military health care, elimination of the 100% tax on disability compensation for military retirees, loss of paid survivors benefits to military widows, denial of fair treatment and compensation to veterans who served as atomic test forces, closure or reduction of services in VA health facilities and many other concerns are lost in committees, sent back to sub committees, omitted from funding legislation and a host of other "big brother" moves which keep them hidden and assured of non-action. In truth, those who have serious problems as veterans, those who deserve restoration of benefits in the retired community, and those on active duty looking for a better quality of life have few friends in Washington. This is a situation, which grows more deplorable with each passing election. Where once, more than half of Congress could claim the title of veteran, today less than a third of that body can boast prior military service. So, for those now in uniform and those who served with honors the enemy is sitting right in the two chambers of Congress and walking the halls of the White House. Copyright © 2001, 2002, 2003, 2004, 2005 by Thomas D. Segel & America's Voices, Inc. All rights reserved.